The FDA continues to update the list of medications being recalled. Over the past year, the Food and Drug Administration has recalled multiple blood pressure medications after discovering a potentially cancer-causing contaminant in some batches. It’s believed they became contaminated during the manufacturing process. The recalled medications include specific “lots” of losartan, irbesartan, valsartran and combination drugs with valsartran. The investigation is ongoing and the FDA continues to update the list of medications being recalled here. Some of the recalled lots contain a combination of medications. Although neither amlodipine nor hydrochlorothiazide are currently under recall on their own, they are when combined with some other medications. For example, a combination of valsartan, amlodipine and hydrochlorothiazide is one product that has been recalled. The FDA website provides lists of valsartan products under recall, valsartan products not under recall, irbesartan products under recall and losartan medications under recall for patients, health care providers and pharmacists to accurately confirm which products are affected. 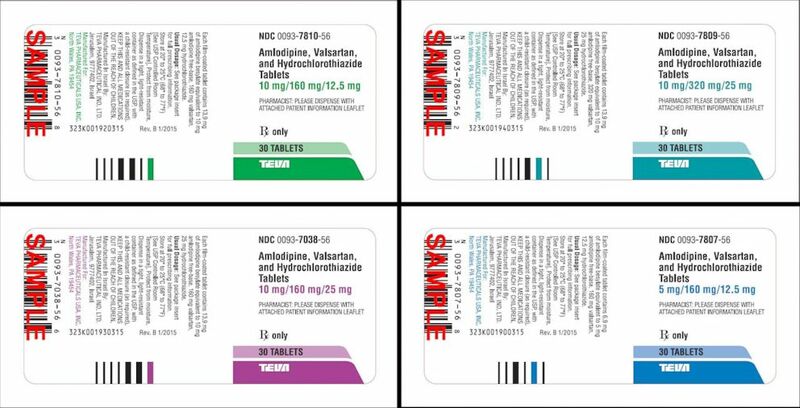 (FDA) Teva Pharmaceuticals USA has issued a voluntary nationwide recall of "all lots of Amlodipine / Valsartan combination tablets and Amlodipine / Valsartan / Hydrochlorothiazide combination tablets." These voluntary recalls come after the discovery of the chemicals NDMA and NDEA at levels far above what the FDA considers an acceptable daily intake. NDEA is a naturally occurring chemical in some foods and it can be found in drinking water, but it’s also present in air pollution and industrial processes. NDMA is a chemical that forms in both industrial and natural processes. Both NDEA and NDMA are classified as probable human carcinogens, meaning they can increase the risk of cancer in humans. With that said, here are some things you should know if you’re taking these medications. You shouldn’t stop taking the medication until you speak to your doctor first. To date, none of the manufacturers have received any reports of people who use these medications becoming ill. If you’re taking a blood pressure medication that was recently recalled, do not stop taking it. So, if you’re taking one of these medications, reach out to your pharmacist or physician to discuss alternative treatments. These medications will lower your risk for heart disease. These medications are for high blood pressure and fall in a drug class known as angiotensin receptor blockers (ARBs). They work by blocking the production of a natural hormone called angiotensin II, which narrow your arteries, raising blood pressure. High blood pressure, which is also called hypertension, causes stress on your heart and can contribute to heart disease. High blood pressure affects 75 million American adults. High blood pressure is one of the most common medical conditions. Blood pressure is a measure of how efficiently our hearts push blood through our arteries. If the pressure is too low, there is a risk that organs will not get enough blood. If the pressure is too high, there’s a risk that the heart will work too hard. Blood pressure measurements are actually two measurements: systolic, which is when the heart squeezes blood through the body, and diastolic, which is the pressure of blood when the heart is at rest. If your doctor says your blood pressure is 130/80, the 130 would be systolic and the 80 would be diastolic. here are several reasons people get high blood pressure and it’s normal for it to fluctuate. It’s important to understand that your blood pressure measurement will vary throughout the day; it’s normal. High blood pressure can develop for several reasons, including having a family history, obesity, smoking, high-salt diets, diabetes, lack of exercise and underlying kidney disease. Often, it can be controlled with a combination of lifestyle modifications and a variety of medications. Dr. Sumir Shah is an emergency medicine physician and Dr. Saumya Dave is a resident physician in psychiatry and they both are members of the ABC News Medical Unit which can be reached @ABCNEWSHealth.